Before we can understand why Dracula is so rich, we need to understand why investments make money at all. Why isn't the current price simply the sum of all future returns? Well, because future returns are uncertain. A business venture might be profitable. Money lent might be returned. And the investor might be around (alive and well as today) to collect when the future return is available. Hence, an investor needs to be compensated for the risk that the investment will not generate a return and for the risk the investor cannot use the invested funds as well in the future as today. I am positing that uncertainty is the single (the one and only) source of financial investment return above the time-value of money (TVM). Assuming we all have an identical time preference, which we do not, the time-value of money can be summarized as a single discount rate, an annual compound interest rate. Let's set the discount rate to 3% whereby $100 today is equal to $103 in one year, $106.09 in two years, and 1.03^n into perpetuity. To any degree that there is uncertainty about collecting the future investment, one would require a premium to the discount rate--an increase in it to compensate for risk (e.g., 3% becomes, say, 5%, which would be 3% for TVM plus 2% for risk). I realize "discount" is counterintuitive, but understand that it simply means discounting a future amount to be equal to a value in present terms. One way to get rich is to have a discount rate (a time-value of money) less than 3%—like say 2%. Then getting someone to pay you 3% in one year’s time is like getting paid almost 1.5 year’s interest in a single year since you only require 2%. It wouldn’t take much leverage (or much time) to make this a very real and very big get-rich-quick (or eventually) plan. Another way to get rich is to have less uncertainty about the future--the mythical crystal ball. Even if it is cloudy, it plus what everyone else (the market) knows is better than only what everyone else knows. This dawned on me when I was listening to Jason Wiser's retelling of Bram Stoker's Dracula (Dracula: The Night King (part 3 of 3), specifically about the 35:21 mark). Because he is an immortal monster, Dracula can simply wait out any temporary problems--go to sleep for forty years as those who hunt him age and die. Now, think about Dracula's time preference for money or anything else. He plays the loooong game. He doesn't need to consume now and can let his wealth work for him quite easily--decade-long naps allow for very deferred consumption. Relative to mortals, he has a very, very low discount rate because his time horizon is astronomically longer and uncertainty from his perspective is much, much lower. What are the implications for us in the non-fictional, mortal universe? Tyler Cowen's Stubborn Attachments wrestles with this concept (confession: I have not read it yet, but I have purchased it, intend to read it, and have listened to approximately 3.79 trillion podcasts of him discussing it). As I understand it, he argues for a discount rate of 0% thereby valuing the future as equal to the present. In such a framework at the individual level you would not be paid a premium for deferring consumption. However, I believe he is proposing this at the societal level and more as a framework for policy making. A conclusion this leads to is generally favoring growth as the primary goal/aspiration for social policy. What about implications for investors? Individuals are not immortal; so unless you are planning a trip to Transylvanian, you better continue to demand compensation for deferred consumption (TVM) and some premium for risk being taken. What about endowments and foundations? I would propose they are not nearly as much like Dracula as they would like to be--in the time horizon and uncertainty dimensions. I won't at this time accuse them of having other Dracula-like qualities (fodder for a future "shots fired" post perhaps). These entities have current and continual demands for withdrawals. An X% annual spending policy and a collection of interested parties with very different perspectives strongly challenges any argument for a lower discount rate. The foundation as a concept may theoretically have an infinite time horizon, but its donors, beneficiaries (both current and near-future ones), and employees do not. At the very least it will be difficult for them to think and act as if there is an infinite time horizon when they should (deferring consumption in tough times) and rather easy for them to do so when they shouldn't (assuming future growth will solve all current shortcomings). Lastly, what about governments? Well, should they really expect to be around into perpetuity? How many can reasonably expect this? So far at least technically the success stories number zero. (Perhaps another future post expanding on this question and applying to foundations as well.) I will grant that governments in a practical sense to a degree (magnitude matters) can assume very long time horizons borrowing against the future. It will work just fine until it doesn't. Given enough splinters (growth-hampering regulations, inflation, entitlement promises, etc.) you'll eventually have a wooden stake. Governments may aspire to be Dracula (see below), but they face many, many obstacles in getting there. The light of day is toxic to their way of behaving. They can seduce with their promises. They create captured minions whose self interest becomes subservient and aligned to the master's. We trust them blindly at our peril. They are incapable of looking themselves in the mirror. 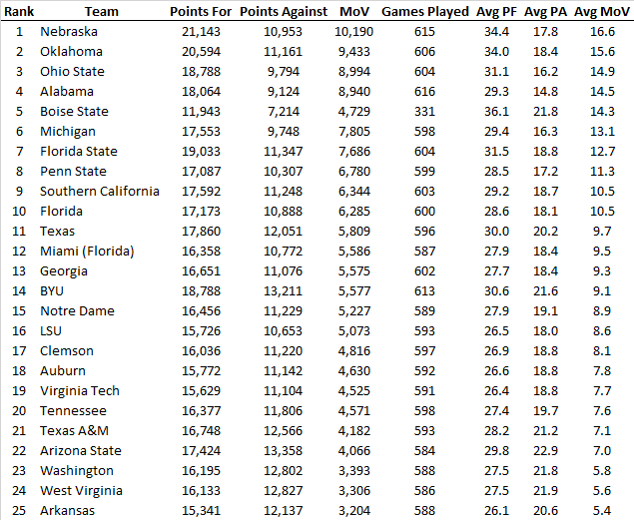 It is about time that I updated my previous work on ranking college football programs. Recalling the methodology from before, I am attempting to answer who's better, who's best. 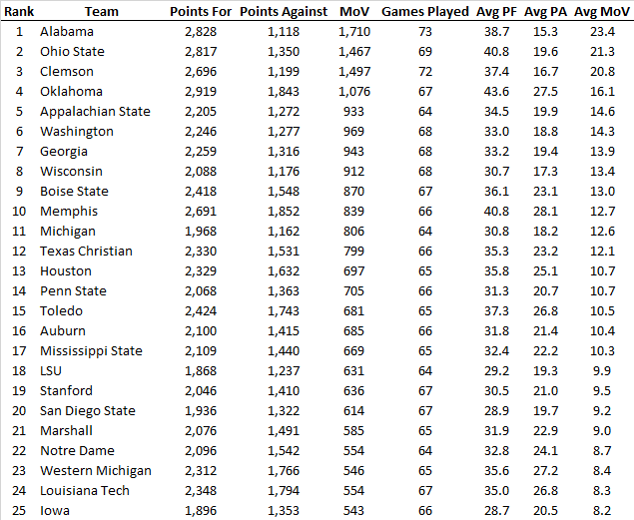 I am limiting the data set to my generation (1970 through 2018) because it happens to coincide with what I believe is the modern era of college football. 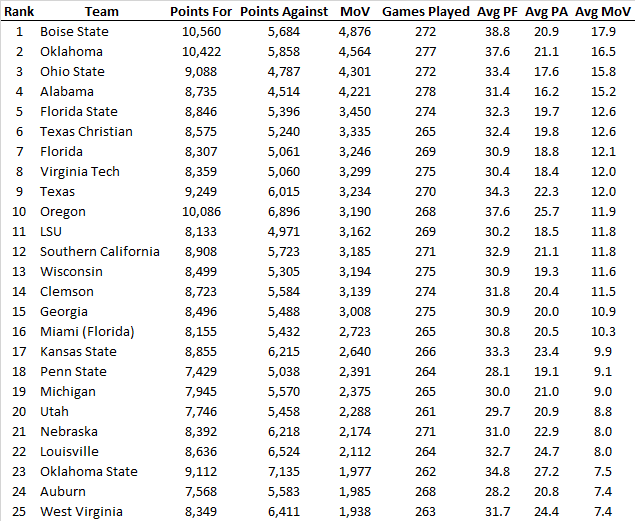 To rank the teams I use average margin of victory. Opinions could differ, but who are you to criticize? Join together with your like-minded brethren to create your own list. Just be objective rather than try to fool us again with some anyway, anyhow, anywhere to make your team come out on top. The results are below and the spreadsheet with the full analysis is here. I just filed my tax return, so it seems like a logical time to post on taxes. The current regime (a Democrat-Republican alliance co-opted by many special interests (law-financial planning-accounting industrial complex, real estate industrial complex, big farm, big charity, and on and on)) has us running in circles. On the one hand they giveth: corporate tax rate cut and increase in standard deduction--the two true highlights of the 2017 Trump tax reform. On the other hand they taketh away: tariffs, which are just taxes on U.S. consumers, and threats of escalations in complexity and burden, +70% top rates and wealth taxes to name a couple. I continue to find actual tax policies (basically everywhere) and most general discussion about tax policy to be a strong indictment of where we are as a society and how (un)critically we think. As an alien visiting your simple planet, I find it quite humorous how unsophisticated and corrupt the whole of taxation is and has always been. It is a Baptists and Bootleggers conspiracy combining the dumb with the evil. As an example, an awkward tension exists between where implied tax levels are (the amount needed to pay for all the obligations and expenditures currently in place) and the current, explicit tax level actually in place (higher than commonly believed, but not high enough). The Republicans/conservatives cannot admit the Democrat/progressive proposal for very high rates is necessary for the very spending they are a partner in. Likewise the Democrats/progressives cannot admit the Republican/conservative fear of high taxation smothering future wealth is well placed. Scott Sumner says tax luxury not wealth or income. John Cochrane takes Krugman, et al. to task for lending support for some recent nonsense and he follows it up with a good discussion on the effective property tax rate. Tyler Cowen warns that the Warren Wealth Tax won't be as popular (or desirable) as Democrats believe. Related to all this is the UBI, and if you don't realize the relation, you aren't thinking critically enough. Arnold Kling offers some thoughts, and note the abstract of this recent paper (HT: Tyler Cowen).